OCast cavallo, cauallo, Eng horsemeat. Villena relates that Turks and Tartans highly regarded horsemeat and were reputed to roast it whole with the tail, thighs and pelt for strength and wisdom from the 8-11 C. The part behind the legs half way down the backbone, including the tail, was sliced diagonally and served with the skin to the most important guests. The others ate the rest of the meat. During the early Middle Ages, the horses were part of pagan sacrifices and they were consumed in non-Christian areas such as England, Poland, Germany etc. Pope Gregory III prohibited hippophagy in 732 for being pagan. Villena states that the meat makes men brave. Salted horsemeat was eaten in desperate situations in Europe as it was thought that warriors had to eat meat. This was most prevalent in the Spanish baron’s battles during the 15th C. Even Juan II, father of Isabel I and Enrique IV, was forced to eat horsemeat in 1420 during a siege headed by Enrique de Aragon, his first wife’s brother. Heat oil in a frying pan over medium high heat. Sear the roast on all sides. Season with salt and pepper to taste. Place it in a roasting pan and roast to desired doneness. Remove from oven, cover with foil and let stand 15 minutes. Mash the cheese in a bowl with a fork. Add the buttermilk and continue mashing until it looks like cottage cheese. Put this in a blender with the other ingredients and blend the mixture. 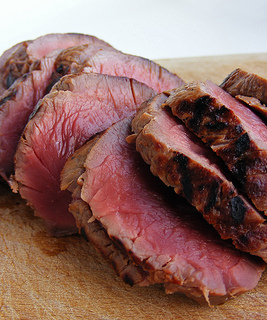 Slice the meat and put it on a platter and serve it with the sauce. Today, mustard can be rubbed on the meat and mayonnaise added to the sauce but neither of these products existed during the Middle Ages. This is very interesting as pagan sacrifices (just think about Homer) and the Papal prohibition may explain the prejudice against eating horse meat. However, it is not so unusual to find it outside the East and Japan: French are traditional horse-eaters and in the North of Italy it is served in many popular "trattorie". Even if some rare stores sell it, it continues to be a prejudice in Spain. Perhaps it has to do with the story that runs in many families of famine during Spanish Civil War and eating horses, cats and rats (all in the same sack). Then, horse is a "noble brute" and aristocratic feelings are rooted so strongly that this together with the beauty of Spanish horse breed is perhaps another reason to explain the prejudice against eating horse meat. The image portraits Phillip IV's statue in Plaza de Oriente, Madrid. The weight of the whole sculpture is on the tail and rear feet, a thing rather difficult to achieve: the story runs that Galileo Galilei in person did all the mathematic homework to make the statue standing. It just seems like common sense that one would not sacrifice a steed that is worth the price of a fancy car unless it had a broken leg or if eating it was the sole means of survival. At different times throughout history we do have cases of horse eating. During World War II, meat was rationed in the United States. For some reason unknown to me one could procure more horse meat with fewer rations then beef. There is one instance of a couple giving a dinner party in which they secretly served horse meat due to the prejudice against it. All was going very well as it is more tender than beef until the host tasted his portion and it was bad. He had to confess what kind of meat it was as he did not want his guests to become violently ill. After that the quests did not touch their plates. I do not know whether they ever accepted an invitation from the couple again. - It certainly was a major embarrassment for the couple. The artistic design was produced by Diego Velázquez, Royal Court Painter, based on his portrait of Philip IV, now in the Prado Museum. This immediately created the problem of how to create a statue rearing horse, with a mount, in bronze. Galileo designed it so that the weight rests on the rear legs. He had the statue was built in two parts. The rear end is solid bronze, while the front part is hollow. Even so it weighs 9 tons. It took 6 years for Pietro Tacca to build. When completed in 1640, King Philip did not like the face. The statue, therefore, was decapitated for 6 months while Tacca made a new one. After that he died! 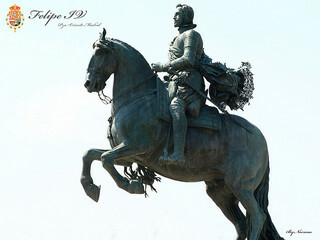 King Philip commissioned the statue to be placed in the center of Retiro Park. It stood there until 1843 when it was moved to the Plaza del Oriente in front of the Royal Palace.